Manuel and I wrote extensively about this species in our recent treatment (Venezuelan Ruellia: A Monograph; Memoirs of the New York Botanical Garden). 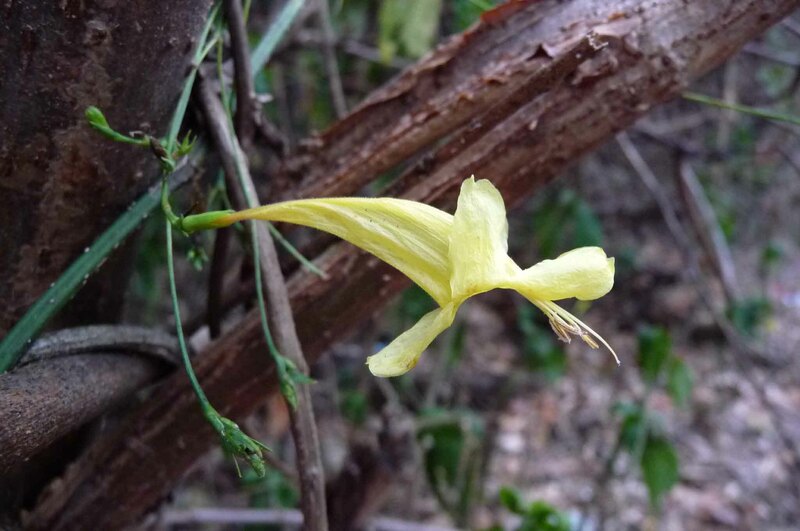 I will paraphrase here: what you need to know is that Ruellia lutea has a miniscule geographic range – one of the smallest ranges of any Acanth known. Ruellia lutea, which masquerades under its former name Ruellia macrophylla var. lutea, is endemic to a small portion of Parque Nacional Henri Pittier (can’t blame anyone for choosing a home in mountains named after a botanist). Here, it occurs in side-by-side sympatry and flowers concurrently with its red flowered sister species, Ruellia macrophylla, which is in contrast an extremely wide-ranging species of northern South America. Ruellia lutea and Ruellia macrophylla are not known to form hybrids… why not? How do they maintain reproductive isolation? Is reinforcement that strong afterall? In any case, the lack of hybrids is precisely why Manuel and I raised Leonard’s variety (one of many I have in mind such treatment for) to the species rank. Curiously, almost none of the collections of Ruellia lutea bear fruit. The reproductive biology of this species remains enigmatic and needs investigation. As always: “be the one”.